Outboard technology has improved dramatically in the last 15 years or so. Today&apos;s direct-fuel-injected 2- and 4-strokes run cleaner, quieter and burn less fuel, reducing their impact on the environment. But there&apos;s room for improvement, and West Marine has recognized two products that can help powerboats operate more efficiently. In its first "Green Product of the Year" competition, the retailer gave the top honor to Mercury Marine&apos;s MercMonitor featuring ECO-Screen, an engine monitoring system that guides the skipper to engine rpm and trim settings for optimal fuel efficiency. 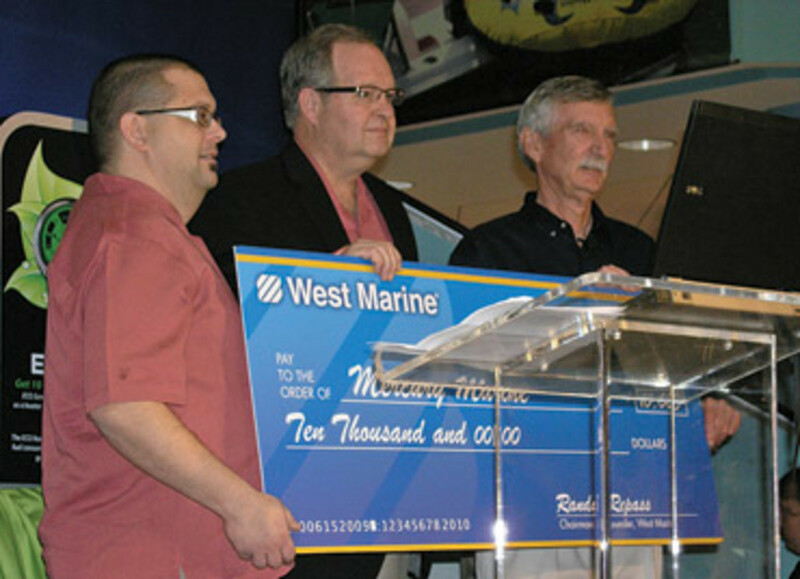 "The winning product is applicable to both new and existing boats," says West Marine chairman and founder Randy Repass, who handed out the $10,000 prize in February at the Miami International Boat Show. "The product can be retrofitted to many older boats. It&apos;s extremely simple to use and easy to install. It really doesn&apos;t take much training to learn how to operate, and it can result in a savings of 10 to 20 percent in fuel - and many boats are very fuel-thirsty. That&apos;ll save boaters money, which is always a good thing, and it will also reduce their carbon footprint." 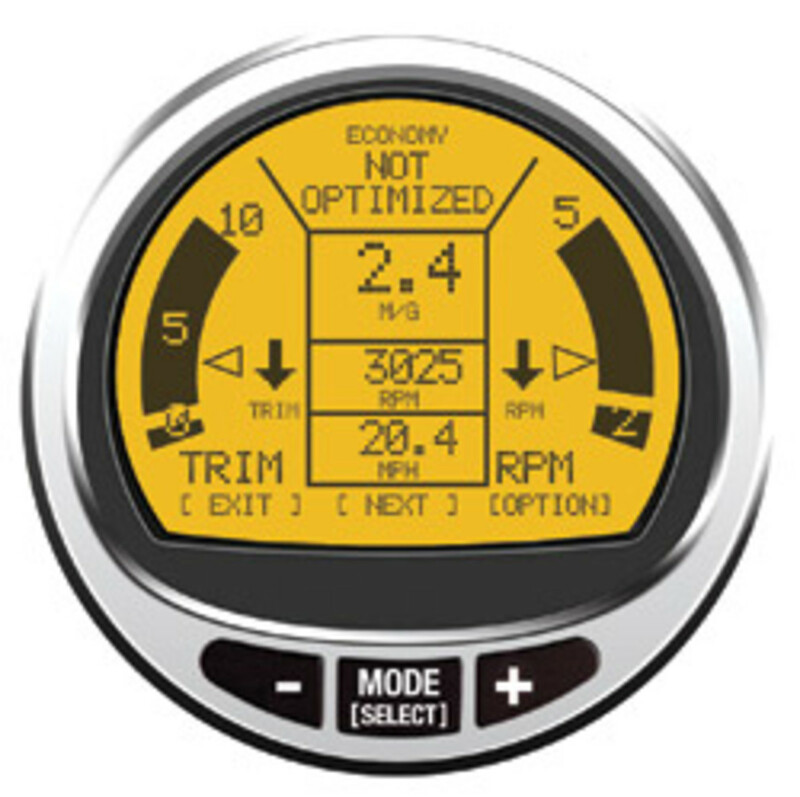 With the ECO-Screen, boaters don&apos;t have to crunch numbers to calculate mileage and range. "What&apos;s nice about the ECO-Screen is that even though it has to take a number of variables into consideration, it does so in a way that requires very little operator intervention," says Chuck Hawley, West Marine vice president of product information. "You simply use the boat, trim the engine, and it learns the most efficient combinations based on boat loading." The ECO-Screen delivers straightforward feedback to the operator - speed up or down, and trim up or down, says Hawley. "While it maps the most efficient combinations of settings, it also continues to modify this map so that it learns your boat&apos;s performance characteristics," he says. 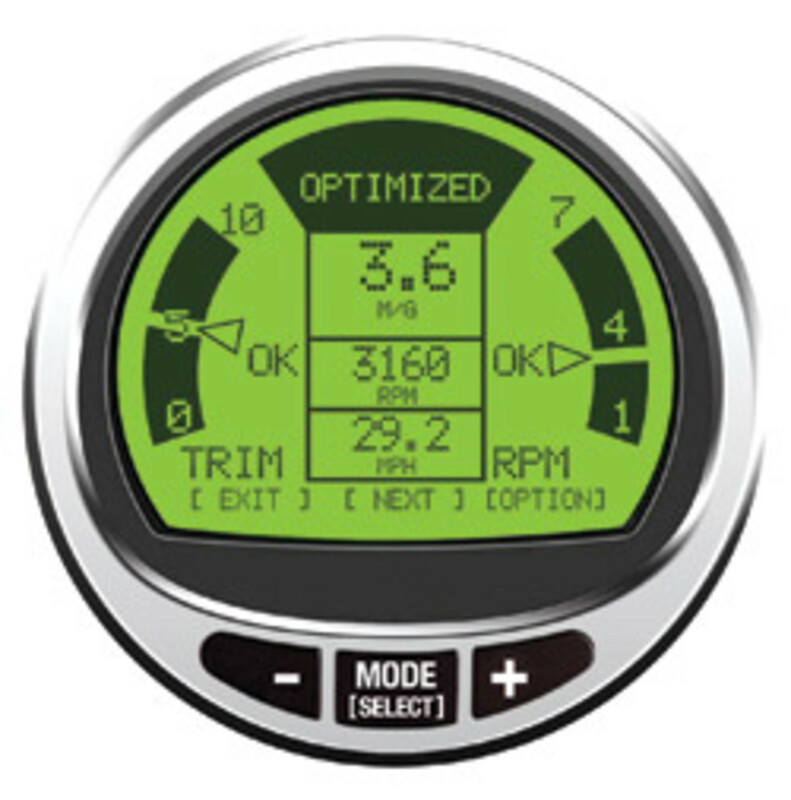 The MercMonitor ECO-Screen, part of Mercury&apos;s SmartCraft engine monitoring system, constantly monitors engine rpm, boat speed, fuel consumption and engine trim to automatically calculate the settings for the best fuel economy. Arrows on the screen direct the driver to increase or decrease engine trim and rpm until the optimal efficiency is reached. When that happens, the screen lights up green, and an "optimized" signal appears. A yellow screen and an "economy not optimized" signal means better fuel efficiency can be attained. Mercury&apos;s John Wyant secured a patent six years ago for the ECO-Screen technology for parent company Brunswick. However, display screen technology at the time was unable to support it at a reasonable cost, plus there was less demand for this type of system, says Wyant, who is associate brand manager for SmartCraft. But once screen technology improved, transitioning from fixed-segment LCD to full-dot-matrix LCD, Mercury saw its chance to take advantage of Wyant&apos;s patent. It took Wyant about a year to integrate the system into the MercMonitor. The LCD technology allow Mercury to make improvements to the ECO-Screen quickly. After the Miami show, the company received valuable feedback that could lead to improvements. "It&apos;s really small stuff," says Wyant. "But the customer spoke, and we heard it." While ECO-Screen gives the operator the ability to fine-tune the fuel economy readings, it will also work fine without user adjustments, says Wyant. "The cool thing about ECO-Screen is you don&apos;t have to change anything," he says. "Out of the box, it will work." By pushing the "Refresh" button, the user can adjust the system&apos;s settings based on its current load, fuel level and number of passengers. "The refresh function erases the [rpm and trim] targets and starts recalculating them," says Wyant. "Naturally, your miles per gallon are going to increase or decrease based on weight, so it&apos;s going to calculate how your miles per gallon are changing. If your boat is heavier, your miles per gallon is going to be less, so it&apos;s going to calculate off of that." The ECO-Screen can be installed on any Mercury engine model-year 2002 and newer with SmartCraft technology. Also, it is NMEA 2000 compatible, which means it can "talk" to other NMEA 2000 electronics units and can be used with other NMEA 2000-supported engine brands, says Wyant. "You can send your engine data to larger screens, like Northstar, Navman, Raymarine and Garmin, and see it on the big screen," says Wyant. "And because it is NMEA 2000, you can put it on a boat with a NMEA 2000 engine that is not a Mercury. You will lose some functionality, but you can still get the ECO-Screen. If I am an OEM, I can put this gauge on every dash no matter what I power it with." West Marine also named a runner-up in its Green Product of the Year competition. Pure Oceans is a 100 percent biodegradable 2-stroke oil that the retailer obtains from Star brite. "There are tens of thousands of 2-stroke engines in use every day which can benefit from the performance of this oil while reducing the pollution that is caused by older-technology engines," says Hawley. "Pure Oceans is an ester-based oil product which is completely biodegradable, fully synthetic, has low toxicity, and it exceeds TC-W3 [2-stroke] standards. The other advantage is that it is a very low-smoke concentration because it is synthetic, so you&apos;ll notice less blue exhaust smoke." Pure Oceans sells for $5.99 a pint and $39.99 a gallon. 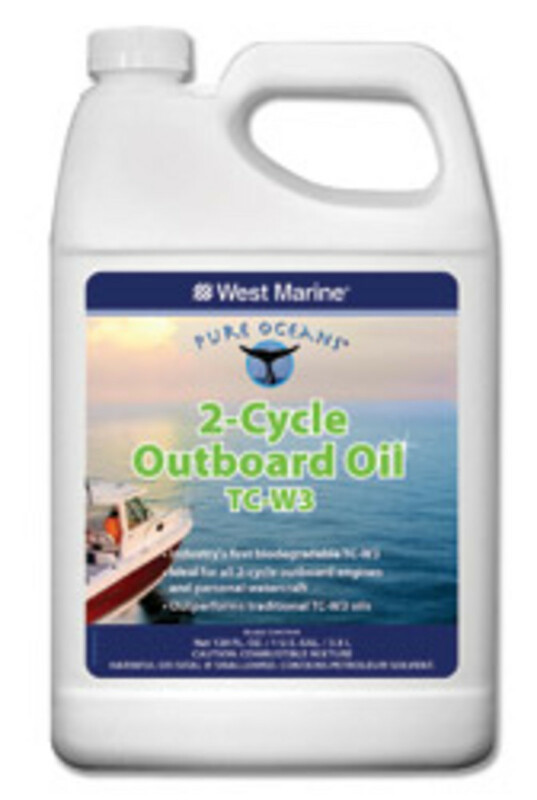 West Marine&apos;s conventional TC-W3 oil is priced at $3.49 a pint and $22.99 for a gallon. "I suspect that the ester-based base oil is an inherently more expensive ingredient than current petroleum-based base oils," says Hawley. "We also use a premium additive pack from Infineum, as we do with our petroleum-based TC-W3 and 4-stroke oils." 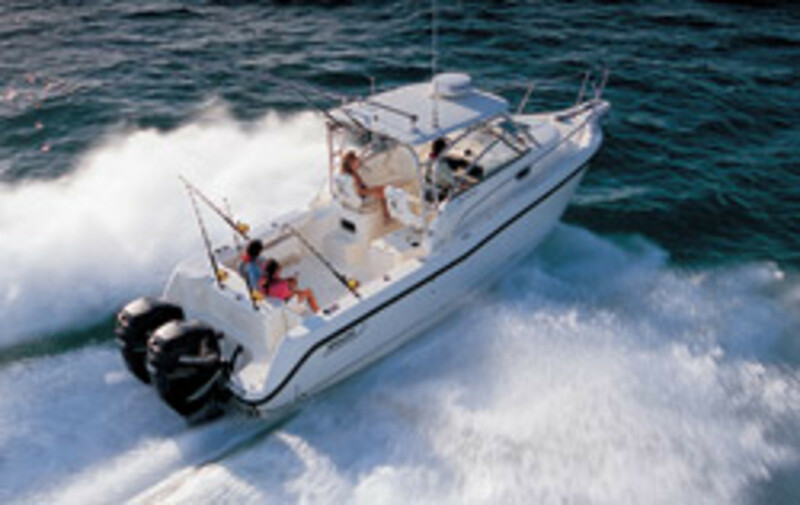 West Marine is accepting entries for its second Green Product of the Year competition. The contest is free and open to individuals, manufacturers, distributors and/or inventors of boating products, according to the company. Completed entry forms must be received by Oct. 1. For information, visit www.westmarine.com/green.